Now in its sixth year, Aussie Wine Month (1-31 May 2017) celebrates the world-class wine produced in our own backyard. A range of events and promotions will be held for wine lovers in cities and regional towns across the country to showcase and champion the diversity and premium quality of Australian wine. 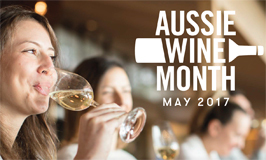 Wine Australia is inviting wineries, wine regions, restaurants, bars, retailers and other interested parties to get involved and register an event as part of the celebration. Registrations are free, click here for more information or contact Sarah Roberts on sarah.roberts@wineaustralia.com.